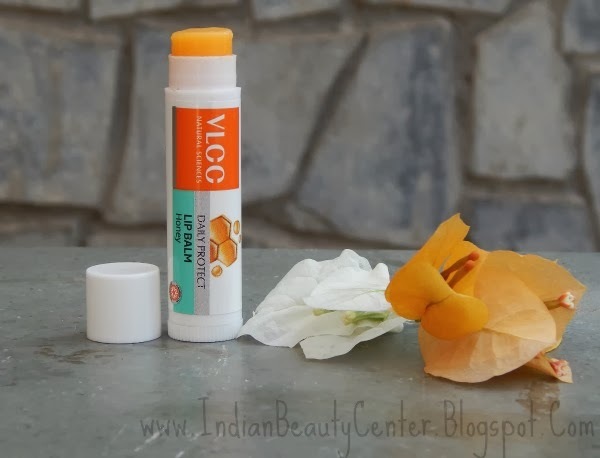 Product Information: VLCC Daily Protect Honey Honey Lip Balm claims to give you smooth protected lips with a glossy shine. It has a light, non greasy formula and provides long lasting moisture. 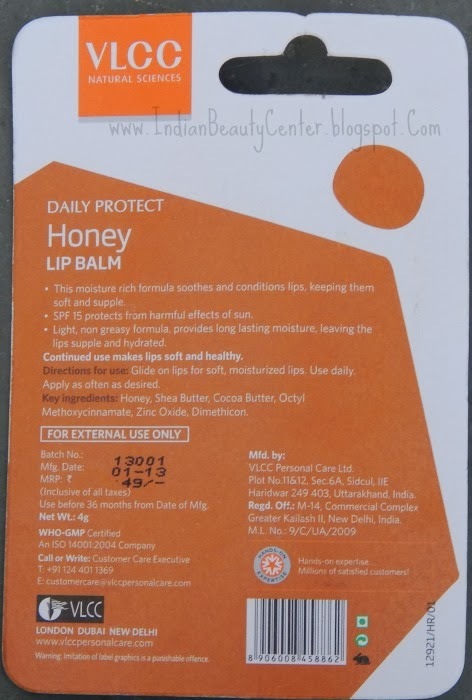 This is a lip balm with SPF 15 and protects your lips from the harsh sunrays. 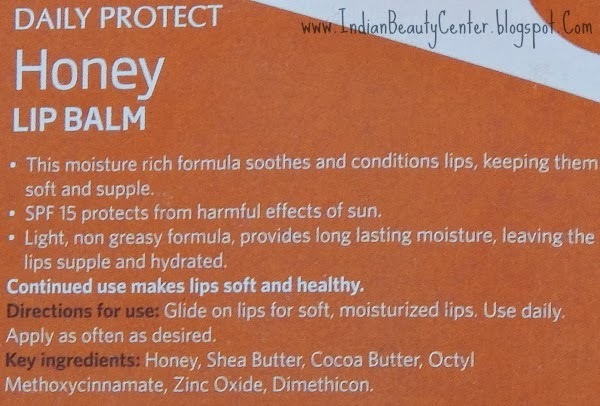 VLCC Honey Lip Balm Ingredients: Honey, Shea butter, Cocoa Butter, Octyl Methoxycinnamate, Zinc Oxise and Dimethicon. 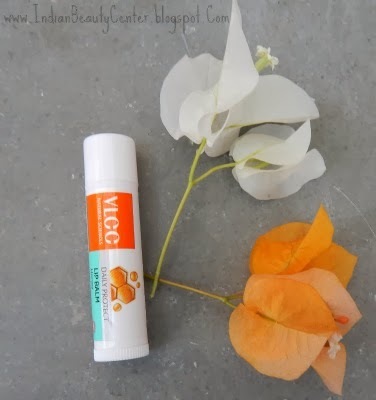 This VLCC lip balm comes in a outer cardboard packaging as you can see below. The retractable lip balm tube is great and the packaging is sleek and travel friendly. This lip balm contains SPF 15 for sun protection and the price tag of just Rs. 49 is amazing! The lip moisturizer smells mild and has a brownish-yellow colored bullet, looks so much like solidified honey :D This is one of the lip care products that does not feel heavy onto the lips. First of all, this chapstick smells heavenly. It is neither too mild nor too strong. It glides over the lips quite smoothly most of the times. I am saying most of the times because the temperature drops to 10 degrees in my hostel sometimes and the lip balm tends to freeze overnight and it becomes a little difficult to apply. Now, its cap is really small and I always keep losing it. I prefer lip balms with those long caps. The lip balm lasts for about 3 hours on my lips and it keeps my lips soft and hydrated. Does it provide any shine? Not really, it has a matte look and is non tinted. Yes, it does give me soft lips but if you have lip pigmentation, then don't expect it to deal with it. Final verdict- For me, it is an affordable lip balm that fulfills all its promises. I don’t really mind the fact that it doesn’t provide glossy shine as long as it keeps my lips happy. Overall, a mind blowing lip balm at a pocket friendly price. It looks like great winter care and reasonable ! Sounds decent. Since this one has no shine, it will work well below lipsticks na? Thank you for shared, Im fan number one of shapstick! This sounds really nice plus I love the fact that it contains spf! I shall give this a try.. nice review!! Very affordable compared to other brand available.